Well not for Sky, when its recent experiential campaign gave a whole new meaning to a binge-watching marathon. To generate a buzz about the new series of Game of Thrones, the show that has taken the world by storm, Sky encouraged TV fanatics to get off the couch and out onto the streets of Italy jogging. 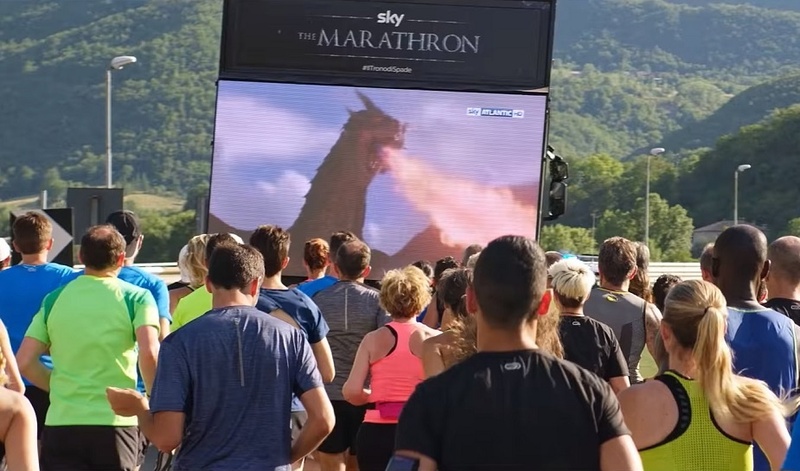 To make it a more enjoyable experience for those taking part in the ‘Game of Thrones Marathon’, Sky placed a huge screen on the back of a lorry which guided joggers through the route of the marathon. But more importantly, the telecoms giant played the first six seasons of the show back to back, immersing the runners and creating excitement about the upcoming seventh season in the process. Unsurprisingly, the stunt gained a lot of attention from the public, as both the screen and the group of runners passed through towns and villages, encouraging people to cheer on the race. The epic event, which kicked off in Rome and finished in Milan, was an ultra-marathon which covered 350 miles, meaning people could run for as long or little as they wanted and watch as many episodes as desired. Through this stunt, Sky not only created even more of a hype about the new Game of Thrones series, it also provided a unique brand experience that allowed fans of the show to connect with it on another level, generating increased loyalty going forward. This isn’t the first brand that has encouraged consumers to get active through experiential marketing. Take a look at when sportswear brand ASICS created a stunt that challenged those brave enough to race against US record holder Ryan Hall, or when Reebok gave Stockholm shoppers the chance to test their speed.